By Dr. S. Lewis Johnson, Jr. Upon initial consideration one might reasonably conclude that Romans 9-11 has little direct reference to the millennial controversy. After all, the word kingdom is not even found in Paul’s great theodicy, and there is no reference, of course, to the duration of it. The chapters, however, are a studied attempt by the apostle to vindicate God’s dealings with men from the standpoint of justice they related directly to what Dodd called,”the divine purpose in history” (C.H. Dodd, The Epistle of Paul to the Romans. London: Hodder and Stoughton, 1932). And if that is so, then they bear rather closely upon the doctrine of the messianic kingdom, for the messianic kingdom is a leading theme of the divine purpose as unfolded in the Scriptures. To take this line of thought one step further, the Scriptures of the Old Testament have as their central theme the coming Redeemer and His purpose through the Abrahamic, David and New Covenants to confer in grace eternal salvation on His chosen people Israel and the Gentiles. This sovereign and covenantal dealing with His people is the overarching theme of Romans 9-11 and, although the length of the kingdom is not a subject of the chapters, the kingdom itself is intimately related to the apostle’s exposition. The indirect reference of the chapters to the millennial controversy is clear and significant. First, as we shall see, the meaning of the term Israel, a key eschatological point, finds clarification here. Second, the hermeneutics of eschatology as it relates to the millennial question also finds clarification in Paul’s use of Hosea in Romans 9.25-26, thought to be a troublesome passage for premillennialists. Third, the most significant contribution of the section to the controversy is the lengthy eleventh chapter with its climactic, “and thus all Israel will be saved” (v. 26). The ethnic future of Israel, which seems to be taught plainly here, bears with weighty force upon the question of an earthly kingdom of God. The contrary viewpoints of Anthony A.Hoekema (The Bible and the Future. Grand Rapids: Eerdmans, 1979, pp. 139-47) , G.C. Berkouwer (The Return of Christ. Grand Rapids: Eerdmans, 1972, pp. 335-49), and Herman Ridderbos (Paul: An Outline of His Theology. Grand Rapids: Eerdmans, 1975, pp. 354-61) and other Amillenarians will be considered at this point in the study. Underlying all of this, fourth, is Paul’s conviction of the relevance of the Abrahamic Covenant’s provisions to the present age of Gentile salvation and to the future time of Israel’s restoration (cf. 4:1-25; 9:5-13; 11:1, 11-32; Gal. 3: 1-29). At this point it will be useful to consider the question. If an earthly kingdom including the land promised to Abraham is the teaching of the Old Testament covenantal promises, why is there not specific repetition of the land promises of the Abrahamic Covenant in the New Testament? I hope to give a sufficient answer to that good question. The term Israel occurs five times in chapter nine. Two of its occurrences occur in verse six, where Paul writes, “For they are not all Israel who are descended from Israel.” It is sometimes thought that Paul in this statement says that believing Gentiles are to be found in the expression, “all Israel.” Thus, their salvation would justify his statement that the Word of God has not failed, “Israel” being big enough to include both believing Jews and Gentiles. That cannot be true. The idea is foreign to the context (cf. vv. 1-5). Rather the apostle is making the same point he has made previously in the letter (cf. 2:28-29; 4.12). The division he speaks of is within the nation, they “who are descended from Israel” refers to the physical seed, the natural descendants of the patriarchs (from Jacob, or Israel). In the second occurrence of the word in the verse Paul refers to the elect within the nation, the Isaacs and the Jacobs. To the total body of ethnic Israel the apostle denies the term Israel in its most meaningful sense of the believing ethnic seed. Gentiles are not in view at all (Gutbrod comments, “On the other hand, we are not told here that Gentile Christians are the true Israel. The distinction at Romans 9:6 does not go beyond what is presupposed at John 1:47, and it corresponds to the distinction between ‘a Jew who is one inwardly’ and ‘a Jew who is one outwardly’ at Romans 2:28 ff., which does not imply that Paul is calling Gentiles true Jews.” Cf. Walter Gutbrod. Israel, TDNT, III, 387. Or, as Dunn puts it, “Not all who can properly claim blood ties to Israel actually belong to the Israel of God [cf. Gal. 6:16]” See James D.G. Dunn. Word Biblical Commentary, Volume 38, Romans 9-16. Dallas: Word Books, 1988, p. 547). As a matter of fact, the sense of the term Israel is clearly established by the meaning of the term “Israelites” in verse 4, and it can only refer there to the ethnic nation’s members. The two occurrences of the term Israel in verse 27 fall plainly within this sense, for the apostle there cites in merged form Isaiah and Hosea as support for the certainty of the fulfillment of the promises, though they may be enjoyed by the remnant only. Israel still refers to the ethnic nation. Finally, in verse 31 the term has there the same sense, referring to the nation’s failure to find justification by faith. The two occurrences of Israel in chapter ten are also plainly references to ethnic Israel. In verse 19, asking if Israel has not known the truth, the apostle cites in proof of an affirmative answer Deuteronomy 32:21, the Song of Moses, delivered “in the hearing of all the assembly of Israel” just before entrance into the land (Deut. 31 :30). Ethnic Israel is meant. The second occurrence in verse 21 is also part of the apostolic exegesis of the Old Testament (cf. Isa. 65: 1-2). The rebellious people to whom Yahweh has spread out His hands in appeal for repentance, as Isaiah wrote, Paul identifies as ethnic Israel. In fact, in this context the rebellious people are specifically distinguished from those who have responded in faith, presumably the Gentiles (Dunn, pp. 626, 31-32). The four occurrences of Israel in the eleventh chapter fall into the same category, referring to ethnic Israel the nation. In verse 2, referring to Elijah’s complaint to Yahweh regarding Israel, Paul reminds the Romans that God responded to the prophet that He had kept for Himself (what a magnificent statement of divine sovereignty in salvation!) a remnant who had not bowed the knee to Baal. The context of I Kings 19:1-21, with its clear statement that Elijah was speaking of the nation ( cf. v. 10), defines the term Israel in its ethnic sense. The second occurrence in verse 7 refers to the same entity, and the apostle makes the same distinction between the two elements within the nation, the believing remnant and the unbelieving nation as a whole. The fact that the mass of the nation was hardened is supported by texts from the Law, the Psalms, and the Prophets. The reference to Israel in verse 25, clearly defined by the statements made in vv. 7-10 and in vv. 11-15, where the nation’s hardening and blinding is stated, can only refer to the ethnic nation of Israel ( cf. the use of the verb “to harden” in vv. 7 and the noun “hardening” in v. 25, both from the same root). That brings us to the eleventh and final use of Israel in Romans 9-11. On the face of it, one would need clear and full justification for finding a different sense of the word here, particularly since the use in verse 26 is closely related to the sense of the term in verse 25. The apostle adds the adjective “all” in verse 26 to make the point that he is speaking not simply of a remnant, but of the nation as a whole, “His people” as he puts it in verse 1. When we come to the interpretation of this section, the divergent interpretations of the term will be handled. One thing may be said: It is exegetically and theologically highly unlikely that the term Israel, having been used in the three chapters of the theodicy ten times for the nation, should now suddenly without any special explanation refer to “spiritual Israel,” composed of elect Jews and Gentiles. In summary, Romans 9-11 contains eleven occurrences of the term Israel, and in every case it refers to ethnic, or national, Israel. Never does the term include within its meaning Gentiles. The New Testament use of the term is identical with the Pauline sense of this section. The apostle, having in chapters 1-8 unfolded his magnificent account of God’s glorious plan of salvation, finds it necessary to explain the almost complete absence of Israel in the account (cf. 2:17-29; 3: 1-8). In fact, Israel has been the most rebellious entity in the story. That, however, presents a problem: Either Paul’s message is true and the Jewish promises are nullified, or the promises still hold and Paul’s gospel is false, and Jesus Christ is a messianic imposter (F. Godet. Commentary on St. Paul’s Epistle to the Romans. Edinburgh: T&T Clark Limited, 1979, vol II, 27). Paul’s answer, of course will not be an either/or, but both/and. His gospel is true, and the promises to Israel still hold. The chapters, then, are not parenthetical, or an excursus. The argument is not yet complete. The indictment of Israel in 2:1-29 and particularly the apostle’s question in 3:1, “Then what advantage has the Jew?,” cry out for explanation in the light of the unconditional Abrahamic promises. Further, in the light of Paul’s description of the gospel of God as “concerning His Son, who was born of a descendant of David,” and that the Son was “Jesus Christ (=Messiah) our Lord” (cf. 1:1-4), then it is clear that in the apostle’s mind the gospel is unintelligible without a full exposition of its relation to Israel, God’s people. Thus, Romans 9-11, where that exposition is found, is “an integral part of the working out of the theme of the epistle” (C.E.B. Cranfield. A Critical Commentary on the Epistle to the Romans. Edinburgh: T&T Clark, 1979, II, 445. Beker is right in saying that the chapters are “a climactic point in the letter” [J. Christiaan Beker, Paul the Apostle: The Triumph of God in the Life and Thought. Philadelphia: Fortress, 1980, 87]). One might ask the question, “But why should the theodicy be put here, after chapters 1-8, rather than after 12:1- 15:13?” Perhaps the apostle realized that the great stress upon God’s sovereign elective purpose and the believer’s certainty of hope in Romans 8:28-39 might be rendered questionable by Israel’s rejection. After all, if God might be frustrated in His purpose, as it might appear from Israel’s history, then is His purpose a reliable ground for our faith? One can see that it should be eminently necessary that Paul respond to that problem. Romans 9-11 is his answer. As Beker says, “Israel’s betrayal does not thwart Israel’s destiny in the plan of God” (Beker, p. 88) Further, not only does Israel’s failure not cancel the promises made to her ( cf. 3:1-8), the facts are that, if the Gentiles are to share the promises of God, then they must get them through Abraham or theory will not get them at all! (Cf. Paul I. Achtemeir. Romans. Interpretation: A Bible Commentary for Teaching and Preaching. Atlanta: John Know Press, 1985, p. 79). That is how far wrong are those who take the position that the church has supplanted Israel forever (Dunn suggests that the church is a “subset of Israel” in the light of Paul’s grafting illustration in chapter 11, II, 520). After expressing his sorrow over Israel’s failure (9:1-5), Paul proceeds to explain that their falling away has its analogy in biblical history itself (9:6-13). The divine dealings with Isaac and Ishmael and Jacob and Esau indicate that there is an elective purpose of God being accomplished within the history of salvation. The natural seed of Abraham inherit only if also the products of the divine elective purpose. The apostle finds the matter illustrated in two passages in the Old Testament, Genesis 25:23 and Malachi 1:2-3. Of course, Paul’s line of reasoning raises the common question, “Is God righteous in His sovereign choice?” That question, incidentally, should be the response of the natural man to all preaching true to the Pauline standard. The apostle’s answer takes the form of replies to two rhetorical, or diatribe-like, questions (vv. 14, 19), one looking at the matter from the Godward side, and the other from the manward side. He affirms God’s right to show mercy and to harden (vv. 14-18), and he denies that God is responsible for man’s lost and rebellious condition (vv. 19-24. For an interesting and helpful study of Romans 9:1-23 one should consult John Piper’s The Justification of God. Grand Rapids: Baker, 1983. One of the delights of this book is its recourse to exegesis in the solution of the great problem of divine election and human responsibility. I must confess that to my mind Arminians usually answer the question, “Is God righteous in His sovereign choice?,” by an appeal to human reason, while Calvinists more often appeal to exegesis of the texts. It brings to mind Carl Bangs’ reference to a statement of an English Calvinist friend of his,” Arminianism is the religion of common sense; Calvinism is the religion of St. Paul” [Carl Bangs, Arminius: A Study in the Dutch Reformation. Nashville, TN. : Abingdon, 1971, p. 18]). After the illustration of God’s sovereign autonomy in the potter and the clay, he points out that, in actual fact, God has been long-suffering in order to demonstrate His wrath and His mercy on both Jews and Gentiles (vv. 22-24). What, then, remains of their complaints? (This sentence is supplied as the apodosis of the condition begun with the ei of v. 22, a common enough phenomena in Greek; cf. Cranfield, II, 492-93). To be God is to exercise mercy against the background of wrath to whomever He pleases apart from any constraints that arise outside His sovereign will. That is His glory and His Name. At this point Paul calls forth the witness of prophecy to show that the Scriptures have predicted that vessels of mercy were to come from both Gentiles and Jews, and that the majority of the nation Israel was to become vessels of wrath (vv. 25-29; see Piper, 203-5).). The expression, “not from the Jews only,” would have been troublesome to many Jewish readers, for it might have implied that the mass of God’s ancient people were left in unbelief “Did Jewish prophecy,” Liddon asks,”anticipate this state of things, which placed Gentiles and Jews, religiously speaking, each in a new position?” (H.P. Liddon. Explanatory Analysis of St. Paul’s Epistle to the Romans. Grand Rapids. Zondervan, 1961, p. 171). Hosea, the Prophet of Unconditional Love, ministered to the Northern Kingdom in the turbulent era of the eighth century before Christ. By divinely designed marital sufferings he played out in his own experience the unfaithful straying of Israel from Yahweh and Yahweh’s conquering love, of which Calvary is the ultimate exposition. Israel’s sin is represented by its ugliest figure, harlotry, and, God’s love by its counterpart, selfless, forgiving, faithful love. The passages cited freely by Paul come from Hosea 2:23 and 1:10. They both appear to affirm the restoration of ethnic Israel after an indefinite time of discipline to their ancient “favored nation” status. The disastrous opening oracles of chapter one are astoundingly reversed, and the pained appeal of a forgotten God in chapter two, followed by unsparing discipline, issues in eternal covenantal union. “The mood,” Kidner says, “is that of the great parable, as though to say, ‘These my sons were dead, and are alive again; they were lost, and are found” (Derek Kidner. Love to the Loveless: The Message of Hosea. Downers Grove. IVP, 1981, 25). The apostle’s citation is a merged one that contains some interesting variations from the Old Testament Hebrew and Greek texts, but basically follows the Greek Septuagint text (I do not have the space to list and discuss all the modifications of the Old Testament Hebrew and Greek texts in Paul’s merged citation. One variation is significant. The apostle in verse 25, citing Hosea 2:23 modifies the verb, “I will say” to “I will call,” this making a clear connection with the “called” of Rom. 9:25 and 9:26. The three fold use of the verb kaleo, to call, underlines the sovereign effectual grace in the nation’s future restoration (cf. Rom. 8:30). The critical point for millennialism is the Pauline hermeneutical handling of the Old Testament passages. It is at this point that premillennialism’s claim that one should follow a grammatico-historico-theological method in the interpretation of prophetic passages has come under spirited attack. Premillennialists have claimed that this method of interpretation leads inevitably to a literal kingdom of God upon this present, although renewed, earth. Amillennialists have disputed this “literal,” or “normal,” use of the Old Testament by the New Testament authors. It is their contention that the New Testament writers, while generally following a literal approach, nevertheless in certain crucial New Testament eschatological passages have followed the principle of “spiritualizing,” or reinterpretation of the Old Testament passages. Premillennialists, therefore, often accuse amillennialists of following “a dual hermeneutic,” that is, of following a grammatico-historical sense generally, but a spiritualizing hermeneutic in eschatology. I am not sure the accusation is a fair one. What amillennialists are saying is simply this: We follow a grammatico-historical method always, but in handling eschatological passages in a grammatico-historical sense it becomes plain that often the New Testament authors give a “spiritualized” sense to Old Testament texts. They “reinterpret” them, and we are obligated by grammar and history to follow them in what they do. Premillennialists deny that the new Testament authors spiritualize, or reinterpret, Old Testament texts. That is really the Brennpunkt, the focus, or issue, it seems to me. Does the New Testament, for example, apply Old Testament promises made to ethnic believing Israel to the New Testament church (cf. Acts 15:13-18; Gal. 6: 16)? We cannot settle this question, as many hermeneutical manuals attempt to do, by theological logic alone. Greg Bahnsen’s counsel is correct, “The charge of subjective spiritualization or hyperliteralism against any of the three eschatological positions cannot be settled in general; rather the opponents must get down to hand-to-hand exegetical combat on particular passages and phrases” (Greg Bahnsen, “The Prima Facie Acceptability of Postmillennialism,” Journal of Christian Reconstruction, 3, Winter, 1976, p. 57). That is to the point, and that is what must be done by premillennialists, if they wish to prevail. The meaning of the sacred text is to be found by the perusal of the sacred pages themselves. It is from them that our hermeneutics must originate. Scriptura ex Scriptura explicanda est, or interpretatio ex Scriptura docenda est. C. Leading Interpretations of Paul’s Use of Hosea 2.23; 1:10. The late George Ladd, for many years Professor of new Testament Exegesis and Theology at Fuller Theological Seminary, was a premillennialist who contended that the New Testament authors spiritualized, or reinterpreted, the Old Testament texts. He said, “The fact is that the New Testament frequently interprets Old Testament prophecies in a way not suggested by the Old Testament context” (George Eldon Ladd, “Historic Premillennialism,” The Meaning of the Millennium: Four Views, ed. be Robert G. Clouse. Downers Grove, IVP, 1977, p. 20). He also claimed that there were “unavoidable indications” that promises made to Israel are fulfilled in the Christian church (Ibid, 27). One would naturally like to know the passages upon which Ladd has built his thesis, and he has given us his principal ones. It would be unfair to spend time on the first two examples, for they are so easily refuted, namely, the use of Hosea 11:1 in Matthew 2:15 and Isaiah 53:4 in Matthew 8:17. His third example is the citation we are studying, that of Hosea 2:23 and 1:10 in Romans 9.25-26. He obviously thought this was a clinching text, for he calls it “a most vivid illustration” (Ibid, 23) of the principle. To its interpretation we now turn. The questions at issue are these: (1) First, to whom do the passages in Hosea refer? (2) Second, to whom are they referred in the New Testament? As far as the first question is concerned, the context of Hosea seems to make it plain that the Northern Kingdom of Israel is indicated by the phrase, “not my people” (Gr., ou laos mou, vv. 25,26). Commentators overwhelmingly favor this. A few students have suggested that, in the light of Israel’s apostasy in Hosea’s day, God now has taken the position that they are as the Gentiles, having no claim any longer upon Him at all (cf. Rom. 9:6; 3:1-8). Such an abandonment of the nation as a whole does not seem contemplated by Hosea (cf. Hos. 3:1-6) or Paul (cf. Rom. 11:2,31-36 [Andersen and Freedman may be right in claiming, “In Deut. 32:21 unidentified foreigners are gathered under the head of lo’-‘am, ‘a non-people,’ What we have in Hosea 1-2 is not a negation of ‘ammi ‘my people,’ but a suffixation of the noun compound lo’-am, my ‘non-people.’ In the latter case ownership is still claimed, but Israel is no better than the heathen” in Francis I Andersen and David Noel Freedman, Hosea: A New translation with Introduction and Commentatry, The Anchor Bible. Garden City: Doubleday & Company, 1980, p. 198]). As far as the second question is concerned, there are several ways of taking Paul’s usage. ( 1) First, as Ladd does, we may refer the Hosea verses about Israel to the church. If this is so, then those who espouse a consistent grammatico- historico-theological interpretation of the Bible would have to modify their position. Aside from Ladd, there are others who take the view that Paul changes Hosea’s sense of the texts. C. H. Dodd comments, “When Paul, normally a clear thinker, becomes obscure, it usually means that he is embarrassed by the position he has taken up. It is surely so here… It is rather strange that Paul has not observed that this prophecy referred to Israel, rejected for its sins, but destined to be restored: strange because it would have fitted so admirably the doctrine of the restoration of Israel which he is to expound in chap. XI. But, if the particular prophecy is ill-chosen, it is certainly true that the prophet did declare the calling of the Gentiles” (C.H. Dodd. The Epistle to the Romans. New York: Harper and Brothers, 1932, pp. 159-160). There are things to be said for this position. First, the following sentence’s opening de (NASB, “and”) can be translated by but. Taken with the phrase, “concerning Israel,” it might appear to contrast Israel to the preceding clauses about Gentiles. Second, the pattern of preference for the “non-nation” in 10:19-20 followed by judgment upon Israel in verse 20 is similar. The “non-nation” there is a reference to the Gentiles (cf. 10:19; 11.11, 14). Third, Peter, it is thought, has the same view of Hosea 2:25 (cf. I Pet. 2:10). (2) Second, others, wishing to maintain Hosea’s reference to Israel as still harmonious with Paul’s reference to the Gentiles in some way, have seen the Pauline usage as an application by way of analogy of Hosea’s words concerning Israel, to the Gentiles. No claim of fulfillment in Gentile salvation is made. This is the view of scholars with no premillennial bias, such as Sanday and Headlam, (William Sanday and Arthur C. Headlam. A Critical and Exegetical Commentary on the Epistle to the Romans. Edinburgh: T & T Clark, 1895, p. 264. They write, “St. Paul applies the principle which underlies these words, that God can take into His covenant those who were previously cut off from it, to the calling of the Gentiles. A similar interpretation of the verse was held by the Rabbis.”) and John Murray (John Murray. The Epistle to the Romans. Grand Rapids. Eerdmans, 1950, II, 38. Murray states that “Paul finds in the restoration of Israel to love and favor the type in terms of which the Gentiles become partakers of the same grace.”). Charles Hodge, also with no premillennial bias, has pointed out that verses of the ten tribes are “applicable to others in like circumstances, or of like character… This method of interpreting and applying Scripture is both common and correct. A general truth, stated in reference to a particular class of persons, is to be considered as intended to apply to all those whose character and circumstances are the same, though the form or words of the original enunciation may not be applicable to all embraced within the scope of the general sentiment” (Charles Hodge. Commentary on the Epistle to the Romans. Grand Rapids: Eerdmans, 1950, pp. 326-27. It would only unnecessarily enlarge the apparatus to cite others who hold the same view). In support of this view one notices, first, that the introductory formula, “as He says also in Hosea,” comparative in force, agrees. There is an analogy between the calling of the Gentiles at the present time and Israel’s future calling as sons of the living God. Second, the threefold occurrence of the concept of the efficacious call (vv. 24, 25, 26), obviously connected, underlines the heart of the analogy. In fact, as the apostle points out in the chapter, the present calling of the remnant (vv. 7, 11-12; 8:28-30; 11:5) is, indeed, an earnest of the calling of the mass. So, to sum up this analogical view, the elective calling of the unbelieving Gentiles finds its counterpart in the future calling of the mass of unbelieving ethnic Israel. Both are works of grace from God. This view, in my opinion, is a legitimate view. (3) But, third, I suggest a more appropriate view, also analogical, but centered in a different correspondence and grounded more soundly in the chapter’s context. The stress of the apostle in chapter 9 does not lie in God’s call of both Jews and Gentiles, although, of course, that is true. The real point is Paul’s desire to show from a salvation history that God has had a sovereign elective purpose of grace in His dealings with Israel (cf. vv. 6-13). Why is the mass of Israel missing from the elect people of God whose spiritual status has been so marvelously set forth in chapters 1-8? God’s elective purpose is the primary cause. The mention of the Gentiles in verse 24 is only incidental at this point. It is the sovereign purpose of grace in the salvation of both Israel and the Gentiles that is the point. In other words, the analogy is not a national, or ethnic one, it is a soteriological one. It is not so much the fact of the calling of the Gentiles now and the future calling of Israel that forms the analogy. Paul, thus, lays stress from Hosea on the electing grace of the calling of both the Gentiles in the present time and the mass of ethnic Israel in the future. This is the point that he finds in Hosea, and it is most appropriate. The use of the verb to call supports the point, emphasizing the fact that God’s effectual calling in elective grace is true both in the salvation of the Gentiles today and in the salvation of ethnic Israel in the future. Therein lies the resemblance, the analogy, the apostle sees in the present situation and in Hosea’s texts. The mention of the salvation of the Gentiles in verse 24 is very appropriate, but their admission into the people of God is itself an act of divine sovereign grace, his theme in this respect their call is analogical to the call of both Israel’s remnant (cf. 11:5) and the future ethnic mass of believers at the time of the Messiah’s corning (11:25-27). A careful study of Hosea’s references will lead the reader to the conviction that no passage could better and more tenderly extol God’s sovereign electing mercy in His compassionate courting and winning of the adulterous wife. He takes the initiative, “allures” her, “speaks comfortably” to her, and triumphantly brings her to songs of salvation grace as in the days of the Exodus. His advances, His efforts to win her back, and His final success are the results of His purpose. The fragment from Hosea 2:23, “I will call those who were not my people, ‘my people,’ and her who was not beloved, ‘beloved,'” if one is conscious of its context, underlines the great principle of sovereign mercy. It should also be noted that, while Paul mentions the Gentiles’ salvation in verse 24, and it is in harmony with his theme of sovereign electing mercy, nevertheless his chief interest is in Israel, as the final verses of the chapter indicate (vv. 27-33; the de of verse 27 is not adversative, as if the preceding verses are about Gentiles, but is continuative, properly rendered by “and” [NASB]). The two passages from Hosea 2:23 and 1:10 illustrate the royal sovereignty in the rejection and reception of men, Paul’s immediate theme. The sovereignty itself is set forth more clearly in the merged citation, while the second states the glorious result of it in Israel’s history more clearly than in the first (CF. Franklin Johnson. The Quotations of the New Testament from the Old Considered in the Light of General Literature. London: Baptist Tract and Book Society, 1896, pp. 354-55). Professor Ladd and others have made their mistake in their initial analysis of the context, thinking that Paul is arguing primarily the relationship of Jews and Gentiles in the divine purpose. That will be more upon the apostle’s mind in chapter eleven. For now it is God’s sovereign dealing with Israel. His usage of Scripture aptly illustrates his purpose. We conclude, then, that there is no legitimate reason to deny to Paul an analogical use of Hosea to support the manner of the calling of the remnant of Israel and the Gentiles in his day. The truth of the divine gracious calling unites the continuing work of God through the ages. Professor Ladd’s best example fails of demonstration, and with it that contention that the Old Testament Scriptures are on occasion “reinterpreted” in the New. More recently the well-known evangelical, Clark Pinnock, at the present engaged in a fevered one-sided vendetta against all the purveyors of sovereign grace from Augustine, Luther and Calvin to modem upholders of the doctrine, has written, “Let us by all means begin with the original sense and meaning of the text,” adding in a new paragraph, “But when we do that, the first thing we discover is the dynamism of the text itself. Not only is its basic meaning forward looking, the text itself records a very dynamic process of revelation, in which the saving message once given gets continually and constantly updated, refocused. and occasionally revised” (italics mine; Clark H. Pinnock, “The Inspiration and Interpretation of the Bible,” TSF Bulletin, 4, October, 1080, p. 6). There are “no crucial reinterpretations” (ibid) of the Old Testament in the New, only inspired interpretations, the Holy Spirit being the final arbiter in biblical interpretation. As John Ball put it in the 17th century, “We are not tyed to the expositions of the Fathers or councils for the finding out the sense of the Scripture, the Holy Ghost speaking in the Scripture is the only faithful interpreter of the Scripture” (Charles Augustus Briggs. General Introduction to the Study of Holy Scripture. Grand Rapids: Zondervan, p. 460. Briggs notes that John Wycliff, the morning star of the Reformation, echoed the though, “The Holy Spirit teaches us the sense of Scripture as Christ opened the Scriptures to His apostles” , p. 455). This is the watchword of historic orthodoxy. Two relatively recent books, one authored by the late Anthony A. Hoekema and the other one to which he has made a significant contribution, have enabled Professor Hoekema, for many years Professor of Systematic Theology at Calvin Theological Seminary, to emerge as the leading defender of amillennialism in our day. His position is well-earned, for his works are soundly argued and written and represent a significant advance over the older works from that position (Cf. Hoekema. The Bible and the Future; Robert G. Clouse, ed. The Meaning of the Millennium: Four Views. Downers Grove, IL: 1977). It must, however, be pointed out that he has primarily simplified an approach popularized in the Netherlands among such Dutch scholars as Herman Ridderbos of Kampen and G. C. Berkouwer of Amsterdam, who have been followed in the United States by their spiritual compatriots, such as William Hendriksen, Palmer Robertson, and Charles Horne. Crucial to the views of these men is the question of the ethnic future of Israel, and it is to this significant eschatological issue that we now turn. Professor G. C. Berkouwer, formerly Professor of Systematic Theology at the Free University of Amsterdam and generally regarded as the Coryphaeus of conservative Dutch Reformed Theology, excused a separate chapter on Israel in his The Return of Christ for two reasons: (1) First, the renewed attention given to Israel due to “the tragic outbursts of anti-Semitism in our age,” (Berkouwer, p. 323) and, (2) second, the rise of the Jewish state in Palestine. We might add a third reason, namely, the importance of the question of the ethnic future of Israel for amillennial eschatology. If Israel has an ethnic future in biblical teaching, then how is it possible to deny to her a certain preeminence in the kingdom of God? The same passages in the Old Testament that point to her future point also quite plainly to her preeminence in that day. So we come to Romans eleven to consider the question. It is the one chapter in which Paul discusses “thematically” the future of Israel (Nils Alstrup Dahl. Studies in Paul: Theology for the Early Christian Mission. Minneapolis: Augsburg, 1977, p. 137). As we have suggested, in Romans 1-8 the apostle has described an elect company’s emergence from sin by divine grace, but Israel (but for a remnant 11:5) is missing from among them! Why? In the heart of the book Paul makes three points in reply. First, Israel’s failure is due to spiritual pride and self-sufficiency, which a careful reading of the Scriptures with their doctrine of divine elective grace might have prevented (cf. 9:6-13, 31, 33; 10:3, 21). Chapter 9 stresses the divine election, while chapter 10 emphasizes Israel’s human responsibility. Second, in chapter 11 a consideration of the existence of the remnant of believers in Israel leads to the conclusion that Israel’s failure is not total (cf. vv. 1-10). The Pauline question (1a), introduced by “then,” is followed by the Pauline answer ( 1b-6) and the logical conclusion (7-10). General apostasy is not contrary to the existence of a remnant, to whom God has been faithful. The failure of the mass is traceable to Israel’s perverse attempt to gain acceptance by works and to the divine election (6-7). In this section Paul makes three points: (1) First, a final fall for God’s people is unthinkable and blasphemous (cf. 3: 1-8). (2) Second, the falling away of the mass of Israel has led to the divinely intended Gentile salvation (cf. vv. 11- 12). (3) Third, arguing from the logic of the situation, Paul says that, if the fall of the mass of Israel has meant “the reconciliation of the world,” their recovery must result in tremendous world blessing, something like life from the dead (cf. vv. 13-15, 12). To illustrate the situation, the apostle unfolds his great parable of the olive tree (cf. w. 16-24). Its intent is to warn the Gentiles against pride and arrogance and to remind them that, while they have inherited with Israel’s believing remnant the covenantal blessings, they will suffer the same fate as the mass of Israel, if they do not continue in faith. The parable closes with a massive a fortiori argument for the restoration of national Israel (23-24 ). That leads into the prophecy of restoration of the mass of the nation to salvation (25-27). Paul has at this point shown that Israel’s restoration in the purpose of God is both possible (faith is the lone condition) and probable (it is more likely than Gentile salvation, which has occurred). He now shows that it has been prophesied. The free citation of verses 26b-27, taken from Isaiah 59.20-21,27:9, Psalm 13:7 (14:7, MT), and probably from Jeremiah 31:33-34 also attests it. The preceding verses have raised the question of the broad sweep of the plan of God for the nation and the nations, and the apostle obliges his readers by surveying the divine purpose. The final balanced sentence is a kind of “reiteration and confirmation” (W.G.T. Shed. A Critical and Doctrinal Commentary on the Epistle of St. Paul to the Romans. Grand Rapids: Zondervan, 1967, p. 351) of verses eleven through twenty-seven. The end of the road for both Jew and Gentile is God’s mercy, and for each of them the road leads to it through disobedience (28-32). Among the warmly debated words and phrases of the passage is the sense of kai houtos in v. 26. F. F. Bruce, for example, has consented to a temporal sense for houtos, claiming that the force is well attested (F.F. Bruce. The Epistle of Paul to the Romans: An Introduction and Commentary. Grand Rapids: Eerdmans, 1963, p. 222. garret evidently agrees, seemingly approving the rendering, “when this is done.” Cf. C. K. Barret, A Commentary On the Epistle to the Romans. New York: Harper & Row, 1957, p. 223). It is, however, a rarer use of the adverb (cf. I Cor. 11 :28? ; Gal. 6:2?). Others have suggested an inferential force. The sense is good, but again there is little support from usage (cf. Gal. 6:2? See Murray, II, 96). Finally, the majority of the commentators have given the phrase a comparative force, translating it by and so, or and in this manner, that is, the manner indicated in the preceding context (1-24, or 25). But there is disagreement over the force of the preceding context, so two views have been taken of the meaning of the comparative force. On the one hand, Berkouwer, together with Hendriksen, Home, Rodderbos and Robertson, refers the expression to the remnant of Jewish believers being saved in this age. It is in this way that all Israel shall be saved. The method is that of Gentile provocation to jealousy, a continuing process throughout the age between the two comings of Christ. Thus, according to these scholars there is no ethnic future for Israel in the sense of a great national conversion at the end of the present age. (Berkouwer, pp. 335-49. There are some differences of opinion among the Dutch group of scholars. Some, like Ridderbos, do expect an eschatological salvation to some extent. “Nevertheless, with however much justice Berkouwer places the emphasis on the ‘now’ of 11:30, this does not alter the fact that ‘all Israel will [only] be saved when the pleroma of the Gentiles shall have come in.’ That speaks of the final event: pleroma here has a future-eschatological sense, just as in v. 12, and pas Israel is synonymous with it [= to pleroma auton; v. 12],” he says. Cf herman Ridderbos, Paul: An Outline of His Theology. Grand Rapids: Eerdmans, 1975, pp. 354-61). On the other hand, Sanday and Headlam and others refer the phrase to the entrance of the Gentiles into the community of the saved. The phrase would normally refer to the nearest antecedent, which is the salvation of the whole number of the Gentiles (25), rather than the more distant reference to Jewish salvation. It is Jewish hardening and Gentile salvation in the immediate context, not Jewish salvation. By provocation to jealousy through the salvation of all the Gentiles Israel shall come to salvation herself. One of the failures of the “Dutch” view is at this point. An important consideration is the future tense of the verbs, “shall be grafted” (24) and “will be saved” (26). The future is ordinarily aoristic in force, that is, it refers then to an event, which would be more compatible with a future national conversion than a continuing one, although the point is not decisive. The final solution is related to other questions to be considered in a moment. The term, if read without consideration of biblical usage might be thought to refer to all Israelites without exception, but the usage of the term and the teaching of the Scriptures argue to the contrary. It means in usage Israel as a whole, not necessarily every individual Israelite (Cf. I Sam 7:25; 25:1; I Kings 12:1; 2 Chron. 12:1-5; Dan. 9:11). The clues to its force are not only the sense of people in verse one, but also the nature of the rejection of the Messiah by the nation, a rejection by the nation as a whole (the leaders and the great mass of the people, but not every Israelite) This usage, as is well-known, is found in rabbinic literature. The Mishnah tractate Sanhedrin (x. 1) says, “All Israel has a share in the world to come,” and then enumerates notable exceptions in a rather lengthy list, including Sadducees, heretics, magicians, the licentious and others. Thus, Paul affirms that ethnic Israel as a whole shall be saved. After the declaration of Israel’s restoration, Paul gives the biblical attestation. It is a free citation from Isaiah 59:20- 21, 27:9, Psalm 14’7, and perhaps Jeremiah 31:33-34 as well. The blend of passages is designed to support the statement, “and thus all Israel will be saved.” The citation makes this simple point: The Deliverer shall save Israel at His advent (cf. Acts 3:19-21; 2 Cor. 3:16). The most remarkable thing about the blend of texts is their foundation in the unconditional (=unilateral) covenants of Israel. In 26b, Paul refers to Isaiah 59:20, a Messianic passage about the corning of the Deliverer. The Davidic Covenant is evidently before him, In 27a, Isaiah 59:21 is in Paul’s thought, and that text is, in turn, “a renewal of the words of God to Abram in Gen, XVII.4,” (Franz Delitzsch. Biblical Commentary on the Prophecies of Isaiah. Edinburgh: T&T Clark, 1877, II, 408. For further comments on the use of the Old Testament here see Michel, pp. 355-56; Joseph Huby, Saint Paul: Epitre aux Romains. Paris: Beauchesne et sea Fils, 1957, pp. 402-3; Ulrich Wilckens, Der Brief an die Romer. Koln: Benziger Verlag, 1980, II, 256-57; Cranfield, II, 576-77; Dunn, II, 683-83; Matthew Black, Romans. Greenwood: The Attic Press, 1973, pp. 147-48, and others). Thus, the Abrahamic Covenant finds its fruition here, too. Finally, in 27b, either Isaiah 27:9 or Jeremiah 31:33-34 are referred to, but the reference to forgiveness of sins makes it fairly plain that the New Covenant is in view (cf. 59:21). All the unconditional covenants are fulfilled at that time! Almost all premillennialists and some important postmillennialists, such as Charles Hodge, John Murray and others, affirm the ethnic future of the nation Israel. And even some amillennialists affirm that their view does not exclude such a future for Israel. Anthony Hoekema writes of the possibility of a large-scale conversion of the Jews in the future (Hoekema, pp. 146-47). While Romans 11 has little to say directly concerning the millennial question, it is difficult to see how it is possible to fit an ethnic future into the amillennial view of the future. The reason for this is simple: The same passages that declare an ethnic future for Israel also speak of Israel’s preeminence among the nations in the kingdom of God. But how can an amillennialist admit a preeminence for Israel in his view of the future, that is, in the new heavens and the new earth? John Calvin took the term Israel to mean here the church, composed of both Jews and Gentiles. He writes, “Many understand this of the Jewish people, as though Paul had said, that religion would again be restored among them as before: but I extend the word Israel to all the people of God, according to this meaning, – ‘When the Gentiles shall come in, the Jews also shall return from their defection to the obedience of faith; and thus shall be completed the salvation of the whole Israel of God, which must be gathered from both; and yet in such a way that the Jews shall obtain the first place, being as it were the firstborn in God’s family” (John Calvin. The Epistles of Paul and the Apostles to the Romans and to the Thessalonians. Grand Rapids: Eerdmans, 1960, p. 437). He claimed Galatians 6:16 supported his view. There are compelling objections to his view. First, the usage of the term Israel in the New Testament is against it. As we have pointed out, never does the term refer to Gentiles, not even in Galatians 6:16. Historically the view is weak, since there is no evidence that the church was identified with Israel before 160 A.D. Further, in the special context of Romans 9-11 Israel is mentioned 11 times and, as we have shown, in not one of the cases are Gentiles in view. And, finally, such a sense would introduce hopeless confusion into the interpretation of verses 25 and 26. If Israel refers to spiritual Israel, composed of Jews and Gentiles, what is the meaning of hardening in part has happened to Israel? We have referred above in the brief survey of Paul’s argument in Romans 11 to the view of the chapter offered by well-known interpreters from the Netherlands, such as G. C. Berkouwer and Ridderbos, and others influenced by them. Among the latter perhaps Anthony A. Hoekema is the most important. It is the contention of these for the most part that Paul refers to the remnant of elect Jews that are saved throughout the centuries by provocation to jealousy through Gentile salvation. Hendriksen’s principal point is that Romans 9-11 contains one important point, namely, “that God’s promises attain fulfillment not in the nation as such but in the remnant according to the election of grace” (William Hendriksen. Israel and the Bible. Grand Rapids: Baker, 1968, p. 49). Is it not rather that Israel’s covenantal promises are not forgotten, because there is a remnant being saved now, while the future holds promise of the fulfillment of the promises in the salvation of the nation as a whole? Hendriksen’s other strong point is that the and so must be interpreted in the light of the immediately preceding context, a point well taken. He then contends that the point of the context is that the hardening of Israel is not complete and never will be. The mystery is that in every age elect Jews will be saved by grace until “all Israel” is saved (Ibid., p. 51). In my opinion there are weighty objections to this view, and I will seek to indicate them against the views of Hoekema and Hendriksen primarily. (1) First, it must be kept in mind constantly that the passage has to do with Israel as a nation, as a people (cf. 10:21; 11:1). As a people they have been rejected, they have fallen away, and the mass of the people, the majority, have rebelled and have been hardened (7, 12, 15). The figures of the passage are collective in nature, not individualistic in nature,–“people” (10:21; 11:1) and “olive tree” (16-24). A reversal of the present situation in this collective sense is an important ingredient of the text (cf. 12, 15,23, “again”). Anthony Hoekema, whose defense of the “Dutch” view is found in his excellent book on eschatology, takes all Israel to be simply the sum of all the remnants of Jewish believers in the church throughout history. But the sum of the remnants cannot equal “all Israel,” as the usage of the term indicates. The sum of the remnants through the ages is still the remnant within Israel. (2) Second, there are two related concepts in the passage that militate against Hoekema’s view. First, there is the concept of a reversal of fortune for the nation (7, 11-12, 15, 23-24). In Hoekema’s view there is simply the continual saving experience of a minority of Jews down through the history of the church. The other concept is that of a future transformation of Israel’s status before God. The note of the future change is found in the same texts, with the addition of verses 25-27. (3) Third, if all that Paul means in this section is that there is taking place a constant grafting in of believing Israelites into the olive tree, since this would have been a rather obvious truth, why would the question, “God has not rejected His people, has He?,” ever have arisen in the first place? (4) Fourth, the a fortiori argument of verse 12 and the statements in verses 11, 14-15, taken together with the future sense of the passage, support the doctrine of the ethnic future of Israel. The views of Berkouwer and Hendriksen have no real “casting away” and “receiving,” no imposition of judicial hardening and no lifting of it. And, further, the auton’s (NASB, “their”) of verses 12 and 15 must refer to different entities, at one time to the mass of the fallen, and then to the remnant of the elect. And, finally, since the verse clearly suggest consequences for the whole world of the salvation of the Israel under discussion, it may be asked reasonably: Why does the conversion of a Jewish remnant, one by one in the “trickle down theory” of the Dutch, lead to such undreamed of abundance in the conversion of the Gentiles? Why does not this happen when individual Gentile elect persons are converted one by one? The Dutch view finds it difficult in the extreme to explain why Paul is so concerned with Israel, when they are no different from anyone else. (5) Fifth, Hoekema equates the continuing “remnant” with “all Israel,” but the context of the chapter certainly seems to contrast them (cf. 10:21; 11:1,5,7,26). And, as was noted earlier, Paul contrasts the two entities in time also, one being now (5), and the other future (23-24, 26). (6) Sixth, in verse 23 Paul says that Israel shall be grafted in “again.” If this is said of the remnant, as Hoekema says, how can this take place? The remnant of elect, being part of the tree, were never broken off (17). The grafting in again of Israel must be, then, the grafting in again of those broken off, the mass of the nation, or the nation as a whole, “His people, ” who have been cast away but shall be received again by virtue of the faithfulness of God to the covenantal promises made to them. (7) Seventh, the interpretation of Berkouwer and the others destroys the climactic element in Paul’s statement that “all Israel shall be saved.” If all that is meant is that all the elect of national Israel shall be saved, as Hoekema appears to claim, then the conclusion is insipid and vapid. Why, of course, the elect shall be saved!” (Murray, II, 97. Robertson seeks to answer this, laying stress on the manner of Israel’s salvation, but the attempt does not succeed in my opinion. Cf. O. Palmer Robertson, “is There a Distinctive Future for Ethnic Israel in Romans 11?,” Perspectives on Evangelical Theology, ed. by Kenneth S. Kantzer and Stanley N. Gundry. Grand Rapids: Zondervan, 1979, pp. 219-21). (8) Eighth, finally, while there is reason for honest difference of opinion over this (Hendriksen sees the reference as pointing to the first advent, but the majority of orthodox commentators who comment on the citation refer the texts to the second advent), the Scripture citation from Isaiah 59:20-21 and 27:9 does not agree, for the citation in its most prominent sources refers to the Messianic salvation at the second advent, not the first advent, as required by the Dutch view. We, therefore conclude that the history of God’s dealings with ethnic Israel as set out in verses 1-11, the logic of Israel’s reversal of fortune in verses 11-15, supported by the illustration of the olive tree and the regrafting of the natural branches of ethnic Israel into it “again” in verses 16-24, and the prophecy of the salvation of “all Israel” in verses 25-27 combine to establish the future of ethnic Israel as a glorious future hope of both Israel and the church. W. D. Davies, in his significant Presidential Address at the meeting of Studiorum Novi Testamenti Societas at Duke University in August, 1976, emphasized some important points that are true to Paul’s thought here. Covenantal forgiveness will take place at the Parousia for Israel. That will be the consummation of genuine Judaism itself The “advantage” of Israel still obtains (cf. Rom. 3: 1-2), priority without superiority. There is a continuity between the olive tree and the root of Abraham, between the Patriarchs (28) and the nation. Fundamental to the fulfillment of the promises is the faithfulness of God. While the Gentiles partake of the promises, Israel still has a “favored nation” status; it is “their own olive tree” (24). And, finally, it is the Lord God who is responsible for the co nsummation the program (W.D. Davies, “Paul and the People of Israel,” New Testament Studies, 24, October, 1977, pp. 25-39,29). “The greatest human character in the Bible is Abraham,” so said Donald Grey Barnhouse some years ago (D.G. Barnhouse. God’s Remedy. Wheaton: Van Kampen Press, 1954, p. 350). Barnhouse’s reasons for the patriarch’s greatness included the frequency of his name in the New Testament. Outside of such expressions as, “Moses saith,” or “Moses wrote,” Abraham’s name stands forth behind Paul, Peter, and John the Baptist in frequency of mention. Further, Abraham’s encounter with God is the pattern of justification by faith (cf. Gen. 15:6; Rom. 4:1-25). Rabbinic theology’s failure is related to its views of the precedence of Moses, over Abraham, as well as its failure to see divine grace in his justification. In an ancient midrashic work (Mekilta 40b) it is said that Abraham was justified by “the merit of faith. ” And, finally, Abraham’s life becomes the New Testament pattern of the life of faith (cf. Heb. 11:8-19). The Abrahamic Covenant has a corresponding importance in biblical eschatology. Premillennialists have laid great stress upon its nature and provisions, sometimes claiming that the correct interpretation of its content really settles the argument over the question of a kingdom of God upon the earth. It is, therefore, rather revealing that Hoekema has no detailed treatment of the significance of the biblical covenants for eschatology (While Hoekema in his chapter on “The New Earth” has some things to say concerning Abraham’s promises, one of the most disappointing features of his work is the absence of a treatment on the covenants and eschatology). The promises that God gave Abraham were threefold: (1) personal promises to the patriarch (Gen. 12:2, “make your name great”); (2) national promises to Abraham’s ethnic believing seed, the stress resting upon the grant of land (12:1; 13:14-17; 15:7; 17:8); (3) universal promises to Abraham’s Gentile seed (12:3; Gal. 3:7, 16, 29; Matt. 1:1 ). Christ is the “in thee,” finally. The promises were unconditional promises, that is, dependent ultimately upon God’s sovereign determination as the striking ratification of the covenant indicated (Gen. 15: 7- 21) .While there are several important features of the ratification, the most striking feature is the peculiar action of God. In other covenants of this nature both parties walked between the pieces of the animals. In this instance, however , God symbolically walks between the pieces, has no detailed treatment of the significance of the biblical covenants for eschatology. and Abraham is not invited to follow! The meaning is clear: This covenant is not a conditional covenant in which certain duties rest finally upon man alone. God undertakes to fulfill the conditions Himself, thus guaranteeing by the divine fidelity to His Word and by His power the accomplishment of the covenantal promises. Herman Ridderbos vividly describes the unilateral nature of the event,” Abraham is deliberately excluded–he is the astonished spectator (cf. Gen. 15:12,17; 54 [Herman N. Ridderbos. The Epistle of Paul to the Churches of Galatia. Grand Rapids: Eerdmans, 1953, p. 131]).” Even the faith that Abraham would exercise is the product of divine efficacious grace. The remainder of the Bible is concerned with the ongoing fulfillment of these promises. In the Old Testament, as the promises receive expansion by the Davidic and New Covenants, many prophetic passages assure the readers of Scripture of their continuing validity ( cf. Isa. II: I-II; Jer . 16:14-16; 23:3-8; 33:19-26; Hos. 1:1–2:1 [Heb., 2:3]; Amos 9:11-15; Mic. 5:1-9; 4:1-7; 7:18-20). Micah 7:18-20 is particularly striking. The final section of this great prophecy shifts to a more lyrical, or hymnic style (Delbert R. Hillers. Micah. Philadelphia: Fortress, 1984, p. 91). It is a choral piece of devotion, a doxology for the noble character of a God who forgives and delights in constant love (v. 18, hesed). Micah means “Who is like (Yahweh)?,” and fittingly the last section of the book begins reminiscently. This type of rhetorical question is usually reserved for His mighty acts ( cf. Exod. 15:11; 34 :6- 7). The challenge is thrown out in verse 18. The book had begun with His advent in wrath against the peoples of the earth (1:1-5). It concludes with a magnificent choral promise of His faithfulness and unchanging love to Jacob and Abraham. The prophet was convinced of the impossibility of the frustration of God’s covenant promises. The cause of the challenge is set out in verses 19-20. Here is the theology undergirding the preceding context. As Allen says, “They have come to repentance, but that is not enough to win back the blessing of God. He is no petulant princeling to be wooed away from a fit of capricious temper. Nothing they can do will avail of itself to secure God’s acceptance. The sole ground of their hope lies in the noble character of God as one who forgives, forgets, and offers a fresh beginning” (Leslie C. Allen. The Books of Joel, Obadiah, Jonah, and Micah. Grand Rapids: Eerdmans, 1976, p. 401) Micah finds his deepest ground of confidence in the patriarchal promises (Psa. 105:8-11). God’s ancient word of grace in His elective promises to Abraham and his seed is expressed in verse 20 as “Thou wilt give truth (’emet) to Jacob and unchanging love (hesed) to Abraham. ” Jacob and Abraham are used representatively as corporate objects of God’s grace (the latter is unparalleled as a name for the people in the Old Testament [Cf. Hillers, p91; James Luther Mays. Micah: A Commentary. Philadelphia: Westminster Press, 1976, p. 168]). God’s unfrustratable loyal love is expressed no more pointedly anywhere else in the prophetic literature. Thus did the prophets understand the Abrahamic Covenant. To the New Testament authors the Abrahamic Covenant is still in force (Leon Morris has pointed out that the New Testament sees the covenant as still being in force in three of its four occurrences, and possibly in the fourth occurrence as well. The Apostolic Preaching of the Cross. Grand Rapids: Eerdmans, 1955, p. 93). Passages of significance include Luke 1:46-55, 67-80, where in verses 55 and 73 a clear indication of the continuing validity of the covenant is affirmed, and that in spite of the apostasy of the Prophetic age that has intervened. And, further, there is no indication that the promises of the land are not included. The swearing of the oath in Zacharias’ prophecy (Luke I :73) is related to Genesis 22: 16-18, and Israel’s supremacy in the age to come is indicated by the clause, “and your seed shall possess the gate of their enemies” (Gen. 22:17). Romans 9-11 is filled with references to the Abrahamic Covenant (cf. 9:4-5,6-13,25-26; 10:19 [Deut. 32:9, 18, 29, 36, 43]), but the most important section is Romans 11:11-27. We have already sought to show that the passage clearly points to the ethnic future of Israel, and that the merged citation of verses 26-27 includes a reference to the Abrahamic Covenant as fulfilled at the time of the second advent of the Messiah. Two questions deserve some answer. The first is: “What about the land promises? They are not mentioned lit the New Testament. Are they, therefore, cancelled?” In my opinion the apostles and the early church would have regarded the question as singularly strange, if not perverse. To them the Scriptures were our Old Testament, and they considered the Scriptures to be living and valid as they wrote and transmitted the New Testament literature. The apostles used the Scriptures as if they were living, vital oracles of the living God, applicable to them in their time. And these same Scriptures were filled with promises regarding the land and an earthly kingdom. On what basis should the Abrahamic promises be divided into those to be fulfilled and those to be unfulfilled? And, then, remember that Peter urged the church to ( recall both the words of the prophets and the things spoken by the apostles, obviously with a view to adherence to them (cf. 2 Pet. 3:1-2). So far as I can tell, Papias, Irenaeus, Justin and others knew no such division of the prophecies. Finally, there is no need to repeat what is copiously spread over the pages of the Scriptures. There seems to be lurking behind the demand a false principle, namely, that we should not give heed to the Old Testament unless its content is repeated in the New. The correct principle, however, is that we should not consider invalid and worthy of discard any of the Old Testament unless we are specifically told to do so in the New, as in the case of the Law of Moses (the cultus particularly [Gordon H. Clark first called my attention to this; Cf. Biblical Predestination. Nutley: P&R, 1969, p. 12]). The second question is this: “Were not the land promises fulfilled in Old Testament times, both regarding the multiplied seed (cf. I Kings 4:21; I Chron. 27:23; 2 Chron. l:9; Heb. 11:12 [partial fulfillment is conceded by all]) and the land (cf. I Kings 4:21)?” The answer is plain: Israel never had anything but an incomplete and temporary possession of the land. The boundaries of Genesis 15:18 were attained only in David’s reign, “and then as an empire rather than a homeland” (Derek Kidner. Genesis: An Introduction and Commentary. Chicago: IVP, 1967, p. 125). Further, the prophets were ignorant of this “fulfillment,” and long after the incomplete and temporary possession of the land looked on to the fulfillment of the land promises (Am. 9:13-15). After my paper, “Evidence from Romans 9-11,” found in A Case for Premillennialism. A New Consensus, ed. by Donald K. Campbell and Jeffrey Townsend (Chicago: Moody Press, 1992), pp. 199-223, was published, a paper incidentally which is essentially the same as this paper, an article by W. Edward Glenny, containing some comments regarding my understanding of the use of Hosea 2:23 and 1.10 appeared in the journal Bibliotheca Sacra (152 [January-March, 1995], pp. 42-59, entitled, “The ‘People of God’ in Romans 9:25-26.” One can see from the title of the article that it touches very definitely upon a section of my paper. In his article, while noting there is much of value in my paper, Professor Glenny went on to criticize my understanding of the use of the citations from Hosea in Romans 9:25-26. I thank Professor Glenny for his kind words, but I would like to respond to his criticisms. In answer to Professor Glenny, let me say a few things. In the first place, I believe that, while he mentions my principal point, he does not seem to understand it. I am not arguing, as Charles Hodge suggested was appropriate, that a general truth referring to a particular class of people (in this case, Jews) may be considered as applying to others who fall into the same corresponding character or situation. Thus, what is said in Hosea of Jews may be said of Gentiles who fall into the same spiritual situation by analogy. The adverb “as” in v. 25 introduces the correspondence. While Hodge accepts this interpretation, which would justify taking Old Testament passages, that refer in context to ethnic Israel, to refer legitimately to Gentiles, I still do not think the context supports it. The context suggests another approach, for the overriding sense of the context is that of the freedom of God to act in electing grace in the salvation of men. It does not have to be argued that Romans 9:6-29 has to do with His sovereign electing grace and mercy (vv. 22-23). Then with a threefold usage of the verb to call, a verb he uses elsewhere of sovereign divine calling in effectual grace (cf. 8:30; 2 Thess. 2:13-14), he cites the passages of Hosea 2:23 and 1.10 and makes his principal point, not that Gentiles may be saved, but rather that the Gentiles and others being saved in this age are saved in the same way that the chosen ethnic Jews of the future are to be saved at the Lord’s coming. The correspondence is not, then that Gentiles are being called and saved now as the ethnic Jews of the future shall be at the Lord’s coming. The correspondence is more narrowly made: The fact is that the Romans are being saved by sovereign grace apart from works through faith alone (v. 30), and they should not be surprised, for their own Scriptures have set out a similar divine work of grace for their benefit (and for the world) in the future. The Jews have stumbled at the rock of offense, although they had in their hands the ancient promise of Isaiah 28: 16 (cf. 8.14). Thus, I plead not guilty to the crimes and suggest without any rancor that my explanation is harmonious with the context. There is no need to appeal to a typological-prophetic fulfillment. The simple analogy, implied in Paul’s “as also,” is sufficient to explain the connection of the Old Testament citation to the New Testament context as, I believe, the majority of commentators, who are not looking desperately for a text upon which to pin their belief that the term Israel may be used to refer to Gentiles (Professor Glenny is not one of them), agree. SOURCE: Modified from a chapter titled, Evidence from Romans 9-11, by S. Lewis Johnson, Jr. in A Case for Premillennialism: A new Consensus. ed. by Donald K. Campbell and Jeffrey Townsend (Chicago: Moody Press, 1992, (c) by Kregel Publications) pp. 199-223. 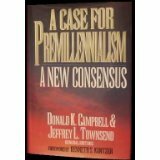 Tags: A Case for Premillennialism A New Consensus, Abrahamic Covenant, Davidic Covenant, Dispensational Premillennialism, Messianic Kingdom, Millennial Controversy, New Covenant, Premillennialism, Romans 9-11 and the Millennium, S. Lewis Johnson, S. Lewis Johnson on the Millennium, The meaning of the term "Israel"